The January 2017 print edition of St Francis Chronicle is now available online for our readers countrywide in South Africa, for those in Southern Africa and for those across the globe. My Festive Season break in St Francis is coming to an end. 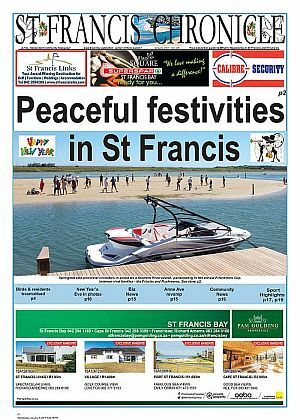 I was delighted to read your “Festive season Review, generally for its report on many visitors’ opinions regarding St Francis Bay. I’m quite certain, that like me, they were expecting heaps of Cape Town glamour and pristine beaches. I was therefore cheering loudly as I read of their general disappointment and disgust – particularly in the para concerning expensive rentals for homes near Main Beach, littered with stinking dog faeces, left by inconsiderate and often lazy pet owners and more offten than not, locals, who should know better. Let me assure these financially pressed visitors that at least you guys can leave after 2 weeks and go somewhere nicer and cleaner next year. We home owners have forked out even more cash for properties here and don’t even have the option of getting out fast in this era of ‘buyers’ markets’ and low prices for holiday homes. The Spit location, which Neville Hulett claims in the Dec edition of this fine paper, is home to a “secret beach known only to the locals”, is litered with dog faeces, so badly that if you try to admire the “awesome’ views from the top as you walk along at high tide, you run the risk of tramping into heap after heap of dog ‘s….t”. Some walk along the wild side that turns out to be. Thanks to Neville’s “Wikileaks-like” revelations, we now know that the pets belong to locals who walk their dogs here in this “secret” place. This happens throughout the year, as we have the good fortune to be able to spend time at our home during the off-seasons as well and the situation is no better. It’s time the “powers that like to think they are”, take this situation in hand like Cape St Francis and the incredibly up-market Keurboomstrand, where notices advise owners to clean up after their pets and in the latter case, the SSPCA provides red plastic bags for the job. Friends in Kommetjie in the Western Cape, tell me that people are fined for leaving their pets’ mess behind, which I didn’t know could work. I look forward to the day, here in StFB. I’d really like to know why little action is being taken on this issue by people who could do something about this in St Francis. Last year, I was set upon by a family’s German shepherd while walking to the beach from Grand Comore road. They claimed their dog “always goes for people wearing white pants” I was in white shorts. Apart from the utter fatuousness of this pathetic ‘defence’, it reflects the depth of arrogance and disregard pet owners in general seem to think they have a right to in this country these days. They definitely think the beachges are there for their and their dogs’ sole use. Two families we encountered on a daily basis, walked up to six animals at once, running rampant on the beach while the owners seem to think that those of us (and our frightened children), who are not enamoured of their pets, are ‘complete’ wimps and losers. This gung-ho attitude is not appreciated anywhere else in the world and it’s quite disgusting how the locals have one face for people they know, and quite another for strangers or visitors. Thank you Michelle for this letter. I will publish it in my February edition out at the end of this month. In the interim I am sending this to the Tourism committee in St Francis so they can hopefully take this up with the authorities – in the hopes that something will be done to to improve the area and make it like it once was.. Have a a wonderful 2017!